Ariel is a 4 columns fixed width WordPress theme by MagPress.com. 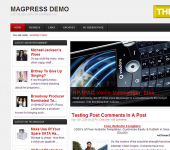 This WordPress template has theme options, featured slider and categories, Adsense ready, etc. This topic contains 1 reply, has 2 voices, and was last updated by Ronald 11 months, 3 weeks ago.